Like the Mystery Men and Great Lake Avengers before them, the Experts are a sympathetic team of assorted weirdoes and underdogs that spend as much time bickering between one another as they do fighting crime. Yes they have powers, but they’re not always capable of controlling them. One foot planted firmly in the Silver Age, the squad consists of voodoo dealing Doctor Delta, green-skinned teen Ninja Witch, mechanical monster Emerald Yeti, the self-explanatory Mr. Elaztik, patriotic blonde Free Mary and the seemingly useless Naked Man. Together they fight crime under the guidance of veteran heroes The Scotsman and the Frost Queen, as well as scientist Bentley Winchester, whose camp, buffoonish personality is but an act to conceal his alter ego, the grim defender Nightguard. 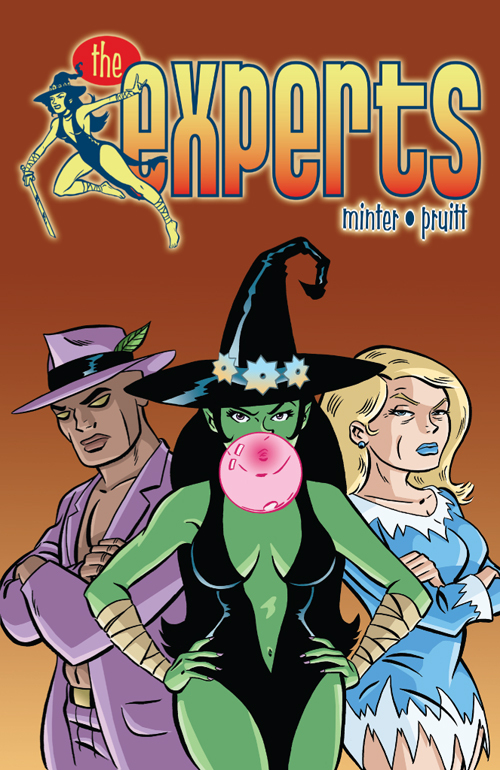 All these characters are recognizable composites of established superheroes, but part of the fun in reading The Experts is spotting Minter and Pruitt’s countless references to the comics of yesteryear. It’s a pleasurable read that doesn’t take itself at all seriously, and writer Kenn Minter belies the jolly retro tone with a good dose of modern cynicism. Stalwarts Scotsman and Frost Queen appear more concerned with profiting from merchandising the team’s likenesses, including such dire products as Mr Elaztik’s Extra Stretchy Taffy, than making the world a better place. Volume 1 of The Experts compiles three issues. In the first we meet the team, and follow Free Mary and Ninja Witch as they foil an art heist by psychic scoundrel the Silver Muse. The second deals with the origin of Doctor Delta, who sells his soul to the devil in exchange for incestual romance, while the third sees Ninja Witch transported in the past and hunted by pilgrims. 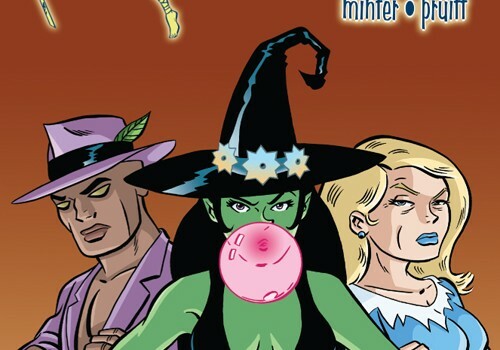 Clarence Pruitt’s character designs evoke the likes of Darwyn Cooke and Mike Allred, but his art is definitely not without its own unique character. Jason Cheeseman-Meyer does take over art duties for a brief metaficitonal comic book extract, which purposely trades the series’ Silver Age charm for a dour 90s aesthetic. This segment runs on its novelty value, but it’s hard to think of anyone other than Pruitt illustrating this team of misfits. I’ve probably used the word “fun” to describe The Experts a few times already, but that’s exactly what this embodies. 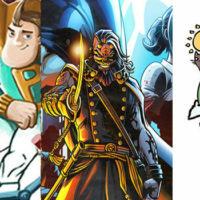 More in line with Archie Comics than anything Marvel or DC are currently publishing, it’s a cushy, frivolous series that serves as a good-natured reminder of the sense of whimsical adventure that contemporary comics sorely lack. The Experts vol. 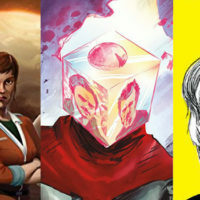 1 is available from ComiXpress for $14.99, or downloaded from ComicsXP for just $2.99. For more info visit www.kennminter.com and http://expertscomic.blogspot.com/.